Hundreds of cats are seeking a home after they were liberated from the poorly run Caboodle Ranch cat sanctuary in northern Florida. According to the ASPCA, almost 700 cats were taken from the premises — the largest number of felines organization has ever seized during the course of an animal cruelty investigation. 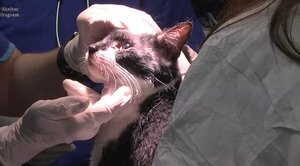 One rescued cat, Peanut, was found with a respiratory infection so severe that he was bleeding from his nose. Following an investigation that lasted more than a year, police obtained a search warrant for the Ranch in late February. What they found at Caboodle was a horror show of overcrowding, rampant disease, lack of sanitary conditions, no effort made to control the population, and several dead cats – either left to decompose in the open or buried in shallow graves. More than 120 responders were involved with the rescue operation. Craig Grant, the operator and founder of the facility, is under arrest on three counts of cruelty to animals, one count of scheming to defraud, and one count of felony animal cruelty.